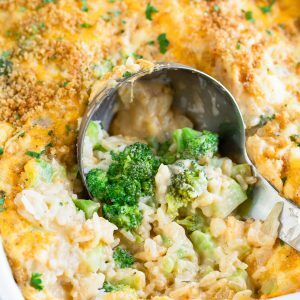 Cheesy Broccoli Rice Casserole - We Love this Vegetarian Recipe! This easy scratch made Cheesy Broccoli Rice Casserole is a total crowd pleaser! We love this vegetarian recipe for everything from holiday meals to family dinners. It can be made in advance and the leftovers rock! No cans or condensed cream-of-anything soup. Sometimes I feel like a bit of a bad@$$ in the kitchen. Other times I grab a 400 degree baking sheet with my bare hands and wind up in bandages. It’s the cast iron skillet fiasco all over again, guys, and I’m kind of a moron. So next time you have a little kitchen snafu and think “Man I’m really bad at cooking” or “I’m such a mess in the kitchen” don’t fret. Instead think of your friendly neighborhood food blogger, who still grabs scalding hot things with her bare hands, drops and breaks drinking glasses like it’s an olympic sport, and makes a big ole mess on the regular. 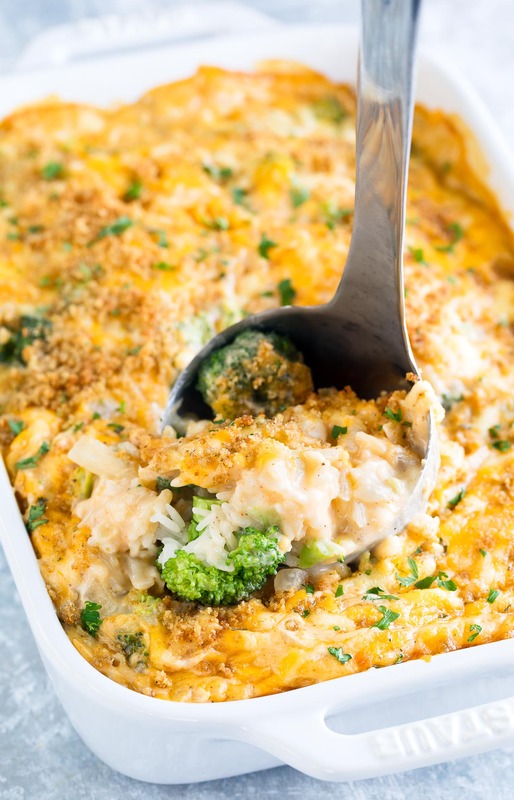 Now that we’ve got the pep talk out of the way, I can thoroughly gush over the amazingness that is this cheesy broccoli rice casserole! HOLY COW it’s good! 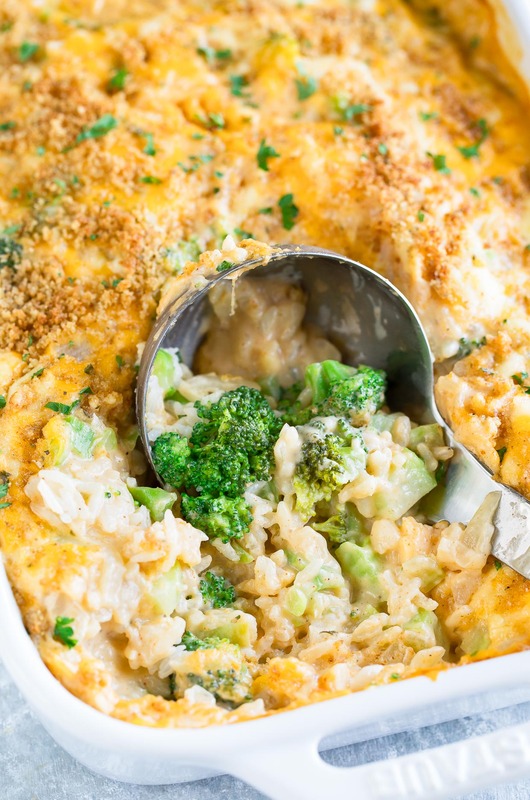 This easy cheesy broccoli rice casserole is one of our favorite vegetarian side dishes! It features a creamy, totally luxe homemade cheese sauce made with gouda, cheddar, and some buttery garlic for good measure! Cue excessive swooning. It’s even kiddo approved! I made this dish recently while Paul was in Africa and shared half with my photog bestie — her broccoli-hating babe gobbled it up! <— hello best news ever! This easy scratch made Cheesy Broccoli Rice Casserole is a total crowd pleaser! We love this vegetarian recipe for everything from holiday meals to family dinners. It can be made in advance and the leftovers rock! First cook your rice via your favorite method. I used my Instant Pot and you could also use a rice cooker or trusty stove-top method to fluff up some rice! While the rice cooks, roughly chop the broccoli florets and chop up those stems as well! I usually chop off the bottom-most portion of the stem and dice the remainder. You'll want a pound total which you can usually get out of one large head of broccoli! Cook via your favorite method. I blanched mine in boiling water until the tops turned bright green. Steaming works great too! Finely dice the onion and mince the garlic. Heat a sauce pot to medium heat and add the butter, onion, and garlic. Cook until the onions are soft and tender, then add the flour and stir into a paste. Continue to stir and cook the paste for about two minutes, or just until it turns a light golden brown. I use whisk and babysit this step to prevent burning. The browning cooks off the four taste and will help us make our sauce nice and thick. Whisk the milk and vegetable broth into the butter and flour mixture. Continue to whisk the mixture while it heats, allowing it to reach a simmer and thicken. Remove from the heat. Season with the salt, pepper, paprika, and cayenne. If you're a fan of nutmeg, add a pinch here. Allspice works great if you're not a fan of nutmeg! Gradually add half of your grated cheese and mix well. Give it a taste and add more seasoning if desired. Since we're not seasoning the broccoli or rice all the flavor is going to come from our dreamy, creamy cheese sauce! Pour the sauce over the rice, broccoli, and cheese, and stir until everything is evenly coated in sauce. Coat an 8x8 or 9x9 casserole dish with non-stick spray, then spread the casserole mixture evenly in the dish. Top with the remaining shredded cheese. Melt 1 TBSP of butter in a small skillet and add breadcrumbs. Mix constantly while toasting, then sprinkle over casserole. Bake the casserole for 35 minutes, or until you get some light browning around the edges and on top. I used fresh broccoli here but you can 100% use frozen broccoli. Steam it up or cook via your favorite method and you're good to go! Craving extra veggies? Carrots, cauliflower, and zucchini also make fabulous mix-ins. You can swap some of the rice for extra veggies if you'd like! Just make sure you cook 'em up along with the broccoli. Both white and brown rice work great here - choose your family's favorite! I went with basmati this time around because we're totally crushing on it lately. If you get a chance to try this cheesy broccoli rice casserole, let me know! You can leave me a comment here (LOVE checking those daily!) or tag @PEASandCRAYONS on Instagram so I can happy dance over your creations. I can’t wait to see what you whip up! Gluten-Free? You can totally use your favorite all-purpose gluten-free flour in place of the conventional flour to thicken the sauce. My favorite one is the cup for cup GF King Arthur flour blend. If you want to forgo the roux altogether that may be possible as well! There will be less of a thick cheese sauce to blanket the broccoli and rice with but I’m thinking the results would be crazy tasty all the same! Let me know if you get a chance to experiment! Delicious! Ive made this twice and really enjoyed it. The only part i get hung up on is step 8 says pour over broccoli cheese and rice but really youre supposed to save that other half for step 9. Im not a frequent cook but my friends now think im at least profocient thanks to you! Appreciate this recipe. Happy Thanksgiving!! So so glad you’re enjoying the recipe and I hope you had a marvelous Thanksgiving Marcus!!! Could i make this the wednesday morning before thanksgiving dinner on thursday? Thanks so much! Excited about it!!! Hi Brandi! Thank you! I personally love the leftovers of this dish so I say go for the make-ahead tactics lol! By the next day the rice rice can soak up some of the saucy goodness but you can add alway stir in a little milk or broth if you’d like. Though I haven’t had a chance to test it yet, I’m curious how it would work making the recipe through step 9 and saving that final bake and breadcrumb for Thanksgiving. Thoughts? Where does the vegetable broth come into this? It’s on the ingredients list, but not in the instructions. Hi Anastasia! Updating the instructions right now, eek! It is whisked in with the milk to make the sauce. Made this for dinner tonight! It was delicious! I only had almond milk and gluten free breadcrumbs and it was SO yummy. The sauce was amazing! Thanks! The combo of gouda + cheddar in here = magic! I love how cheesy and delicious this is. 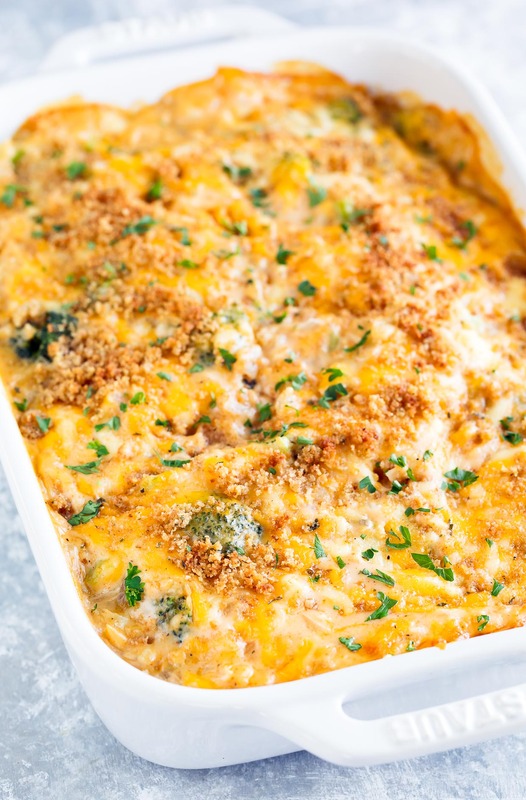 Broccoli and cheese, you can’t go wrong! This sounds so yummy and comforting, and I love the spices added. Yum! Whatever rice you adore and eat on the regular should work great! I used Basmati b/c it’s our favorite right now. I’ll add a note in case anyone else had the same question! Thanks Karen! In your recipe for Cheesy Broccoli Rice Casserole I do not find a quantity for the Broccoli. Am I just overlooking this? Hi Vickie! All fixed now – for some reason it was in a past draft of the post and then not the final draft on the recipe card. Super strange. I’m beyond grateful you pointed it out so I could put it back in there! Thank you so much!